The initial problems faced by 231 K 8 when it returned to mainline servive in 2015 now appear to have been overcome and it has enjoyed a successful year that has included a season of trips from Rouen to Dieppe and Le Havre in conjunction with PVC. On the morning of 7th October the locomotive is seen (above) heading across the Picardie plain with a Paris - Chaulnes excursion, possibly its last trip of the year. There are only four passenger carrying coaches behind the support coach, an indication of the level of support. Sadly, 231 K 8's next planned trip to Compeigne on the 28th October was cancelled due to insufficient bookings. Photo Jean-Louis Poggi. After more than 5 years under overhaul, 141 R 840 returned to service in September 2017. For its second excursion, on Sat Oct 21st, the locomotive travelled up the former Paris-Orléans main line to Paris Gare d'Austerlitz. The rake consisted of six historic, green, mixed 1st and second class carriages and the crimson postal wagon of AAATV Centre / Val de Loire. Diesel BB 68540 was tucked in behind the steam engine as a precaution, but also to facilitate the reversal manoeuvres in the Paris region. For the steam engine is restricted to 30 kph when running backwards by itself. To turn the 141R the two locomotives had to operate out to Orly Ville and then to Juvisy and back to Austerlitz. The steam train was received on platform 16 at Austerlitz and arrived exactly on time at 11.31. The train had stopped for an hour at Etampes which seems to have been principally a media event for television. At the Paris terminus, a few dozen onlookers studiously photographed the arrival. The train first stopped outside the roofed section of the station. After a few minutes, 141 R 840 was detached and discretely advanced up to the buffers for the "bain de foule". The steam train left at 17.00 to return without incident to Orléans. No 840, impeccably turned out, is ready for a new period of nearly 10 years in action after a lengthy (and costly) overhaul that included verification of all the wheels in Germany. The locomotive (constructed in Philadelphia) entered service with SNCF in 1947 and retired in 1970 having operated 1.6 million km. In service for AAATV since 1992 the loco has covered 37,000 km to date in preservation. She is an oil burner with a top speed of 100 kph. Above 141 R 840 storms through Chamarande on the outward journey. Photo D Michel Costes. Having paused most of the major rail projects inherited from the Hollande administration, the French government has commissioned Jean-Cyril Spinetta, former head of Air France-KLM to draw up a fresh strategy for France's rail sector. The strategy will produce a model for France's rail services that will inform legislation to be introduced next year to enable the liberalisation of the domestic passenger sector after 2020, and in particular how multiple operators would provide high speed services. Jean Cyril Spinetta is 74. His initial career was in the civil service before moving onto aviation where he was President of Air Inter for three years and President of Air France for eight years. SNCF Reseau have announced that an additional 8km running line is to be built betwen Strasbourg and Vendemheim. At present the mainline, north of Strasbourg where it runs alongside Hausbergen Yard, consists of two southbound and one northbound track. Traffic, particularly with increasing TER services has now reached saturation point, and there is no capacity for further growth. The additional running line will also allow improved scheduling, increased stopping trains in the vicinity and improve reliability. The work will consist of building a new 6km section of track and renovating and electrifying an existing 2km section. In addition a 400 metre noise barrier will be constructed at Mundolsheim. Preliminary work on the €117 million project has been completed with public consulation taking place until early November. A Declaration of Public Utility is then anticipated with the work scheduled to be completed by 2020. Beauvais - Abancourt - Le Tréport. Budget agreed for regeneration. More details have been reported in the local press(*) about plans to regenerate the TER line from Beauvais to Le Tréport Mers-les-Bains via Abancourt. The line will temporarily close from June 2018 to December 2019. The trains will be replaced by autocars during the closure. All the rails, ballast and sleepers will be replaced between Beauvais and Abancourt (47 km). On the section Abancourt - Le Tréport (57 km) there will be partial replacement of sleepers (1 in 3) and the oldest rails will be changed. Level crossings will be renewed and platforms will be re-surfaced where necessary or demolished in the case of those in stations now closed. Signals not in use will be removed. The platforms at Le Tréport will be made wheel-chair accessible. The total budget is 71 million euros. 71% will be paid by Hauts-de-France Region, 15% by Normandie Region and the remainder by SNCF Réseau. 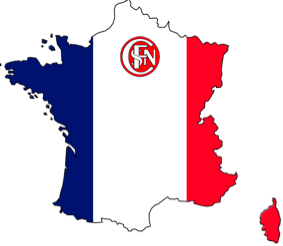 The French State will make no contribution. The modernisation is expected to eliminate current speed restrictions at 60 kph and keep the line open for the next 30 years. Beauvais - Le Tréport is operated by TER Hauts-de-France. The line is partly located in Normandie (76 Seine-Maritime) - between Aumale and the terminus at Le Tréport (49 km). There are 6,000 passengers a week on average, mainly school children and tourists in the summer. Mondays to Fridays there are currently 5 return services by rail from Beauvais to Abancourt (with 6 stops) in 56 minutes. 3 services continue from Abancourt to Le Tréport with a 4th one on Friday evenings. On Saturdays there are 4 return services along the line in 1h53m with 11 stops. On Sundays there are 3 return services. The first in the morning starts from Paris-Nord and the last in the evening from Le Tréport returns to Paris-Nord. It can be estimated that, on the re-opening date, journey times between Beauvais and Abancourt should be improved by at least 10 minutes and between Abancourt and Le Tréport by at least 15 minutes. This country line runs through attractive scenery and those interested should note that it is still operated with Lartigue semaphore signals and telegraph poles and wires are also still visible between Blangy-sur-Bresle and Eu. These items of infrastructure may be partly or totally swept away in the modernisation. Abbeville - Eu expected to close in June 2018. There is no news about the future of this short 32 km line with one or two TER trains a day between Abbeville and Le Tréport. It is expected that the line will close next June at the same time as the Beauvais line (described above). However, there is no information at present about any plans for a later re-opening. This seems unlikely in view of the limited traffic potential. Work has started on a new station to the east of Angers at Trélazé on the Angers - Saumur - Tours line, to serve the new Quantinière district. The new station will consist of two 162 metre long platforms linked by a partially covered 10 metre wide overbridge. Costing €8.1million it is expected to be completed in August 2018. With ten services each way daily it will offer journey times of five minutes to Angers St Laud and 30 minutes to Saumur. Note. Looking at my 1961 SNCF Atlas I note that there is a station marked at Trélazé, so technically this might be a re-opening. After a year major repairs to the 29 km Neufchateau - Gironcourt (Vosges) freight branch on the Culmont Chalindrey - Nancy line are nearing completion. The €5.14 million project includes the replacement of 9,000 sleepers, nearly two kilometres of track replaced, and eleven kilometres of track re-ballasted. The line serves the O I glassware factory at Gironcourt with one or two trains a day operated by Europorte. O I Manufactoring have met 30% of the cost and SNCF Reseau 20%. The balance has come from the State, Grand Est Region, the Vosges Department and local municipalities. 141 R 1126 in steam again ! 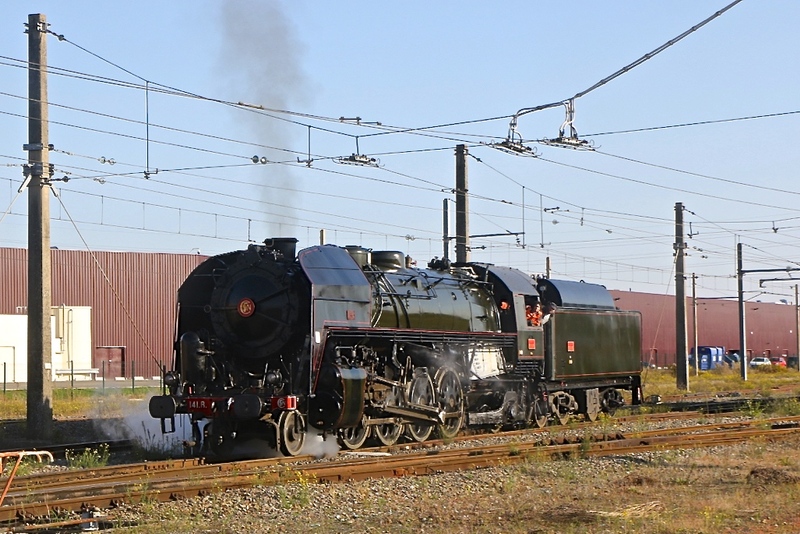 Over the weekend of 14/15th October 141 R 1126 made a number of test runs covering several hundred metres around St Jory Yard (around 20 km to the north of Toulouse) to start the running-in procedures following its extensive overhaul. It was a great moment for the team of Le Train Historique de Toulouse that has spent the last five years restoring this machine. Following successful completion of the test runs, brake tests were undertaken in preparation for it's loaded test run to obtain mainline certification. The loaded test run should take place in November between Saint Jory and Saint Sulpice (on the Toulouse – Albi line). The first test was made in August (but with wood fire) a few days after the arrival of the locomotive at Saint Jory . This new open air location is due to the closure of the workshop of SNCF in Toulouse. Chemin de fer Historique de la Voie Sacrée (CFHVS), Bar-le-Duc, Meuse. We described this new heritage line in January. During 2017, the site was opened on the first Saturday of each month from April - September. The association has not yet received authorisation to carry visitors on its train. The local council has not yet fulfilled its commitments to construct the visitor centre, sheds for the rolling stock, and the car park. So the project is on stand-by and during the open days the steam train made demonstration runs into the terminus. The Corpet-Louvet steam engine "Suzanne" is stored in a small metal shed but there is nowhere on the site to keep the replica carriages under cover. The association is hopeful that it will be able to advance the project in 2018. Two open wagons are under construction to carry the public. 500 visitors attended a historical reconstruction on Sept 3rd. Association SGVA, at Boucieu-le-Roi, Ardèche has constructed, for the first time, a building, next to the station, to protect their rolling stock and to improve working conditions. The metal framework was erected during August. The boiler of the Pinguely bicabine 0-3-0T No 31 (1909) has been sent to a contractor in the UK, Israël Newton in Derbyshire. It will be copied to produce a completely new boiler that is scheduled for completion in 18 months time. The three Class CC 72100 remaining in traffic 72180/72186/72190 have been transferred to the Infra Sector. They were noted at Le Mans and Sotteville on the 18th October. By the 25th October they had arrived at Granville for leaf-grinding duties. It is unclear what will work PVC's tour from Sotteville to Dieppe on the 18th November. Advertised as a farewell to the CC 72100s the literature suggests 72158 although this was withdrawn on 4th October. Paris - Toulouse traffic doubles. Plans have been announced for the redevelopment of the former seven hectare La Chapelle Depot. The site will be converted into a multifunctional development. To be called CHAPELLE INTERNATIONAL it will include 33,000 m² of offices, 56,000 m² of housing, 8,000 m² of Small Office Home Office (SOHO) and a 45,000 m² multi-modal logistics facility, with an Urban Rail Terminal for interconnected urban logistics. This large format railway magazine has been published every two monthsin France since 1980 . It covered railway subjects and model railways. It was the first to publish a double page fold out poster, later copied for a while by Rail Passion. No 221 of Voie Ferrées Magazine (May - June 2017) was the last one. The Editor has been obliged to retire for medical reasons and the magazine has closed. The publisher, Presse et Editions Ferroviaire, remains in business with a catalogue of specialist books on railway subjects. Back numbers of the magazine are available and it is reported that those with subscriptions may receive a credit note for the value of the outstanding magazines, useable on the publisher's site. The last steam engines built in France were designated 241 P and 35 of these locomotives were produced from the Schneider factory at Le Creusot between 1948 and 1952. Among the most powerful steam locomotives ever used by SNCF, the units of the 241 P "Mountain" class were assigned to express passenger services. They could haul 800 tons at 120 kph. The last one was withdrawn from service in September 1969 at Le Mans. Four have been preserved and we report on their status. Below at Chagny on 24th September, 241 P 17 is returning from a week end trip to Belfort. It is late in the evening and the loco is preparing to change ends of the short train in order to proceed tender first to Le Creusot. Photo D Michel Costes. The doyenne of the class is No 17, built in 1950, and now owned by the town of Le Creusot where it was constructed. Repairs to return the engine to service took 12 years. Since 2006, the 241 P 17 has regularly operated excursions to Nevers, Dijon, Belfort, Lyon, Marseilles among other destinations. The attached photo of a departure to Nevers from Etang-sur-Arroux in 2006 represents an untypical moment of fire and fury ! Usually the giant locomotive is quiet and discrete with its light load of 4-5 carriages and faithful wagon of extra coal and spare parts. This locomotive entered service at Dijon in 1949. It was withdrawn 20 years later at Le Mans after 1.6 million km. From 1973 - 2008 the loco was displayed at Guitres in the Gironde. It was then transferred to the Périole depot next to Toulouse-Matabiau station where AAATV Midi-Pyrénées has been restoring the loco for service. Due to redevelopment projects, the Périole depot has been closed and the 241 P 9 is the only occupant remaining on site at this time. This is a problem because no other "home" has yet been found. Currently the loco is isolated in a shed while the two turntables and traverser deck are out of action until November pending completion of a fuel service station. The four pairs of driving axles and wheels (diameter = 2 mètres) have been returned to Toulouse from Meiningen, Germany this summer, after verifications and adjustments for conformity with standards. This has taken 4-5 years. After some adjustments to the axle boxes, the body can then be fitted back on to the driving wheels. The axles and wheels of the tender have to be sent to Meiningen but it is not expected that checking and adjusting them will take so long. The wheels and tender are on different tracks and the traverser deck is needed to be able to reunite the locomotive with its wheels. Some work on the boiler will be necessary. It is estimated that a minimum of 3 more years will be required before the engine can operate. Finding a new home seems to be the most difficult challenge. (With thanks to Georges Turpin for photo and information provided). This locomotive is displayed at the National Railway Museum (Cité des Trains) at Mulhouse. © Peter Lovell & Graham Skinner. The French Railways Society 2017. Thanks to Georges Turpin, Jean-Louis Poggi, D Michel Costes and Chris Gwilliam. Photos by authors unless credited. Merci beaucoup à Georges Turpin, Jean-Louis Poggi, D Michel Costes and Chris Gwilliam.